LOCKLINEEmmeline Snively was a Mother of Beauty for hundreds of models in post-war America. How did she create beauty? And what is left of it nowadays? In The Mother of Beauty, we project the universal theme ‘the meaning of beauty’ onto the beauty industry in Hollywood in the 1940s and 1950s. To be more specific, onto the Blue Book Modeling Agency at Wilshire Boulevard, the agency where Marilyn Monroe got her start. How did Miss Emmeline Snively, owner of the agency, create beauty? And to what extent are those values – all these years later – still felt by Emmeline’s models and people that knew her? They know her intense, almost obsessive relationship with beauty like no other and the necessity of being beautiful in post-war Hollywood. And they know everything about aging, and the constant battle to stay young. To what extent is beauty part of our society, and how does it affect us in our daily lives? The Mother of Beauty is being made by the Dutch documentary production company Van Osch Films. We are almost there, but in order to finish this documentary we need your support! Van Osch Films creates cultural and social documentaries as well as television series. All our documentaries have a distinct trademark – they are always probing and personal. These personal stories cut close to the bone but also touch and inspire the viewer. They show secrets, fear, pain, motivation, inspiration and love. Our documentaries cover a wide range of subjects and topics; from the late Marilyn Monroe and the Dutch musical group Bots to the world-famous photographer Jan Banning. Other topics include absent fathers, Indonesian comfort women, confessing criminals, hidden histories, grieving widows and passionate artists. This project is supported by the bkkc. This project is also supported by: Omroep Max, Brabant C, Netherlands Film Production Incentive and CoBo. I think it was my inner self that kept saying: you can do it, you can do it. Believe in yourself. Real beauty is on the inside, isn’t it? The Dutch director Frank van Osch (1962) started his career in 1989 working for Dutch television. In 2005 he decided to focus on making documentaries and started his documentary production company ‘Van Osch Films’. Niekie Kleintjens graduated at Sint Lukas Film School in Brussels, Belgium. She’s working as a producer for several years and produced documentaries for Al Jazeera and BBC World. She also worked for an international media organisation as program coordinator for international journalism projects. Niekie is currently producing documentaries for Dutch television. 2010 Through our own eyes, Africans Telling African Stories | 45 min | Producer | South Africa, Egypt, Ghana, Ivory Coast - Holland Doc | international exhibition World Press Photo | Beeld voor Beeld filmfestival | online film festival Humanity Explored | Filmtheater ’t Hoogt. Niet mijn naam maar Melle Verlare op de aftiteling alsjeblieft. Ik hoop dat het gaat lukken Frank! Graag niet mijn naam (ik sta er toch al op), maar Ko Verlare op de aftiteling. Toi, toi, toi and see you at the première! Heel veel succes! Ik ben erg benieuwd naar de documentaire. Ik hoop dat het jullie lukt, ziet er een heel mooie documentaire uit en ik zou hem graag zien!!! Ik was graag voor het pakket met de photoshoot gegaan, maar dat zat er helaas niet in. Succes gewenst vanuit Antwerpen! Mooi project. Zet 'm op met de laatste loodjes! Succes! Wij zijn iig. bij de drive in. Tof! Mooi idee Frank, veel succes! Beste Frank Ontzettend mooi dat je er nu bijna bent!! Ik zie uit naar de release!! Ik verheug me op de Drive-In!! Ik heb de 50% volgemaakt ! Succes. Ben erg benieuwd. Veel succes! Ben erg benieuwd naar deze docufilm, Frank. Kom ik met mijn rondleidingen extra met gasten naar jouw studio in de Wtwee. Hartelijke groet, Bianca Tangande. Voor de meest creatieve documentaire maker van Nederland! Ik kijk uit naar de film! Nog maar 2 dagen te gaan! Er ligt nog een donatie van het bkkc in het verschiet. Deze krijgen wij alleen als we voor maandag de 80% hebben bereikt! We moeten dus nog zo'n 10% voordat we er zijn. We hopen dat iedereen dit toffe project wil steunen! Dus deel de pagina met je vrienden, kennissen en familie zodat we de campagne tot een succes kunnen brengen. Voor maar €25,- krijg je bijvoorbeeld al een ticket voor de Drive-In Cinema première van de film! Nog 5 dagen te gaan! Tijd voor een update..
De mussen vallen van het dak. Regisseur Frank van Osch en editor Hinne Brouwer zijn druk in de weer met post-its in de montagekamer. Tegelijkertijd nadert het einde van onze crowdfundingcampagne. Samen hebben jullie al meer dan 18.000 euro bijeengebracht voor The Mother of Beauty. Fantastisch! Toegezegd geld van bkkc meegerekend, zitten we op ruim 82 procent van ons streefbedrag. Maar dat is nog niet genoeg. Twijfel je nog over de foto van Marilyn Monroe? Gewoon doneren. Die staat prachtig boven de bank. Wil je echt uitpakken? Denk dan ook aan de overnachting in het Crowne Plaza in Scheveningen die we hebben weg te geven. Nog 17 dagen te gaan en vandaag al behaalden we 50 procent van het benodigde bedrag voor de realisatie van The Mother Of Beauty. Van de 30.000 euro is reeds 15.270 toegezegd. Daarvoor willen we jullie heel hartelijk danken. We zijn er nog niet! Draag je de film echt een warm hart toe, like dan The Mother Of Beauty op Facebook en nodig je vrienden uit om het resultaat met ons op groot scherm te komen bekijken in een drive-in cinema ergens in de lente van 2018. Early bird tickets zijn nu te bemachtigen door een donatie te doen van 25 euro of meer via deze Cinecrowdpagina. You're receiving a ticket for an exclusive online premiere. You can watch the documentary for a week on Vimeo and your name will be included in the ending credits of the theatre release. Super! You're receiving a ticket for a 50's style drive-in cinema showing (In the Netherlands) or for the Los Angeles premiere! Every contribution above €25,- will be able to come to the drive-in cinema or the LA Premiere. + Your name will be included in the ending credits of the theatre release. Awesome! You’ll receive a specially compiled DVD box with prizewinning documentaries made by Van Osch Films including this film. 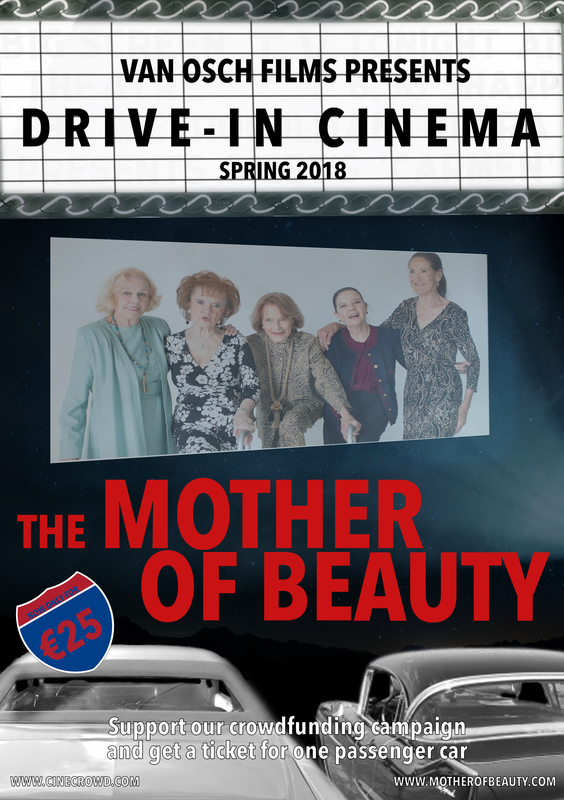 You can also come to the drive-in cinema (In the Netherlands) or the LA premiere! + Your name will be included in the ending credits of the theatre release. You can take a look at the discovered archive of Emmeline Snively in the Bennies Fifties Store in Scheveningen. Never before seen pictures of Marilyn Monroe! A weekend in September. + You can come to the drive-in cinema (In the Netherlands) or LA premiere, you’ll receive the specially compiled DVD box including this film and your name will be included in the ending credits of the theatre release! You can take a look in the discovered archive of Emmeline Snively. One of the contributors wins a hotel stay for 2 in the Crowne Plaza in Den Haag. + You can come to the drive in cinema (In the Netherlands) or LA premiere, you’ll receive the specially compiled DVD box including this film and your name will be included in the ending credits of the theatre release! A unique photoshoot with a professional photographer in 'Marilyn Monroe Style' clothes or '50's style clothes' in a pink Cadillac! In Scheveningen at the Bennies Fifties Store. + You can also take a look at the discovered archive of Emmeline Snively. You can come to the drive-in cinema (In the Netherlands) or LA premiere, you’ll receive the specially compiled DVD box including this film and your name will be included in the ending credits of the theatre release. Fans of Marilyn Monroe, pay attention! You're receiving a print of a unique photo of Marilyn Monroe out of the discovered archive of Emmeline Snively. + You can also take a look at the discovered archive of Emmeline Snively. You can come to the drive-in cinema (In the Netherlands) or LA premiere, you’ll receive the specially compiled DVD box including this film and your name will be included in the ending credits of the theatre release. You can come to the premiere of the film! You will also receive a never before seen picture of Marilyn Monroe from the archive of Emmeline Snively. + You can also take a look at the discovered archive of Emmeline Snively. You can come to the drive-in cinema (In the Netherlands) or LA premiere, you’ll receive the specially compiled DVD box including this film and your name will be included in the ending credits of the theatre release. Gold! You will receive a golden record of Marilyn Monroe. And You can come to the premiere. + You’re receiving a print of a unique photo of Marilyn Monroe. You can come to the drive-in cinema (In the Netherlands) or LA premiere, you’ll receive the specially compiled DVD box including this film and your name will be included in the ending credits of the theatre release. 138 supporters have contributed to this project!